Yarmouth, as a port town, was home to some of the first imported cars. Wealthy businessmen like Charles Murphy and Seymour Baker imported roadsters in 1903 and 1904 respectively. As cars became more common it caused an outcry from the horse and buggy set. Rural people tended to scorn the noisy new machines as rich men’s toys that blocked the roads and scared the horses. They wanted to restrict their road access to certain days of the week. The county councillors, who had jurisdiction over the country roads, were mostly farmers. The drivers were city folk and piqued to find they were sometimes banned from the roads. The 1908 amendment to the 1907 Motor Vehicle Act allowed every local jurisdiction, even within a single county, to set it own rules. Most allowed cars on the road only one day a week and not necessarily the same day. It made it impossible to travel across jurisdictions in some areas. This was not changed until 1911. 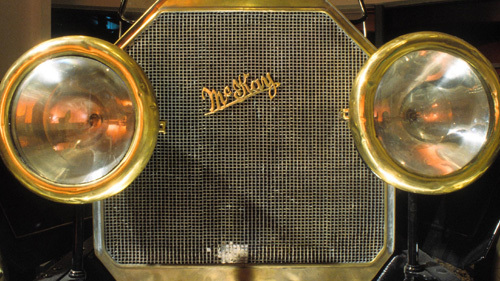 In 1910, when the McKays began manufacturing, automobiles were still a novelty on Nova Scotia’s roads. By this time there were 106 motor vehicles registered in Nova Scotia, 46 more than 1907, the year vehicle registration began in the province. As anywhere, the development of good roads was essential to the rise of the automobile. In the early days of European settlement in Nova Scotia most communities were established on the water so there was little need for cross-country roads except for the few built by and for the military. Large scale industrial concerns found the railway a more efficient way to move materials and products. Road-building tended to be locally financed and controlled. There was an increase in government spending on roads in 1907 and again in the 1930s. By then cars were becoming common enough that there was more demand for good roads. The popularity of cycling at the turn of the turn of the century also promoted road building.